As always I found this week’s photo challenge fascinating in where it leads me. If you manage to read to the end I think you will be as amazed as I was! The word ‘Fresh’ immediately led me to photographs I had taken of my adorable granddaughter picking fresh fruit and vegetable from my garden. I love to do this in season and then cook with the children, soups, pies and crumbles. But then yesterday was rather special in many ways, not least a solar eclipse! It was also officially the first day of Spring yesterday here in the UK; a fresh season with fresh delights. This is when I switch from sauntering through the Gloucestershire countryside seeking out snowdrops, to heading for the Herefordshire borders hunting out wild daffodils. The best place to see these beautiful fresh flowers is in what is known locally as the ‘Golden Triangle’, namely the villages of Dymock, Kempley and Oxenhall. I have mentioned before that snowdrops were picked commercially by the local women and children of Sherborne to be whisked off by train to London and sold for 6d a bunch in flower markets like Covent Garden. 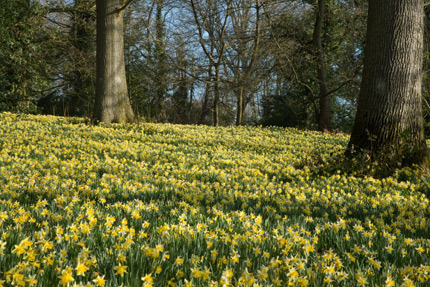 Similarly, daffodils were picked commercially in the golden triangle. 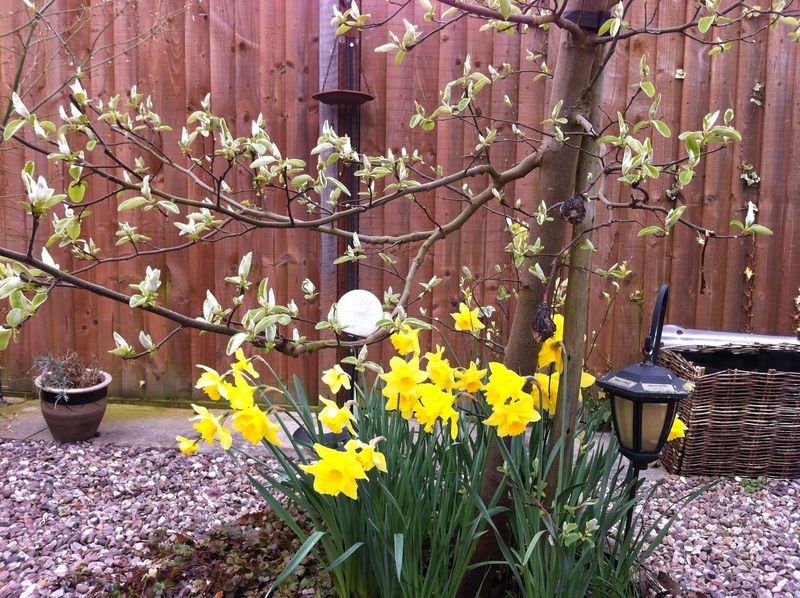 You can read about the daffodils and see some beautiful photographs on the Glos Oracle website if you would like to know more. As is often the way on my days out I got totally sidetracked and ended up in a fascinating little place called Upleadon. Named after the river Leadon, this is a small village with a fascinating history and some superb buildings. But what struck me as I drove over the hill in glorious sunshine was what looked like snow covered fields in the distance. As I got closer I realised it was actually a vast expanse of farmland covered in polytunnels. Having explored, investigated then googled I discovered that Upleadon has been a fruit growing area for hundreds of years. Cider orchards were cultivated next to many of the farmsteads including Middletown before 1700. In 1627 a garden was known as the cherry hay and in 1678 an arable close was called perry grove field.In 1739 it was reported that Thomas Hammond’s estate included several thousand fruit trees from which one tenant had made 100 hogshead of cider in a year and in the late 1770s it was said that the fruit from orchards in Upleadon made excellent cider. Among orchards planted in the corn fields by the early 19th century were several of squash pears and in leasing Lower House farm in 1817 the landowner James de Visme reserved pear but not apple windfalls. Both apple and pear trees were also cultivated at Middletown which was one of the farmsteads with its own cider mill. I was really struck by the juxtaposition of the ancient church of St Mary the Virgin which has a thousand years of history, and the really modern cultivation methods. It appears that polytunnels have caused some controversy as they can be rather unsightly when they cover large areas of farmland. However, as a consumer I have to say I am delighted that I can buy (or pick) fresh local strawberries, raspberries, gooseberries, Victoria plums and blackcurrants from mid-June to August and different varieties of apples and pears from September to Christmas. An added bonus is that growers use much less herbicides and insecticides on fruit grown in polytunnels as they are not as prone to rot or disease. Now here is the bit that just took my breath away literally and gave me a fresh lead in my family history search. As I was searching online for the history of Upleadon I came across a fascinating document held by the Gloucestershire Archives. It was the file of documents re: Thackwell Roche estate. The former Roche estate at Aghada (in county Cork, Ireland) came into the possessionof the Thackwell family in the second half of the 19th century. 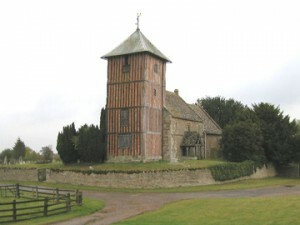 The Thackwells were related to the Roche family of Trabolgan. Another document describes how the Thackwell Roche estate comprised Norman’s Land estate near Old Rock, Dymock, (here on the Gloucestershire/Herefordshire border in the Golden Triangle) as well as lands in Ireland. Believe it or not my great grandfather William Roche was the son of James Roche and he comes from that very area. I have searched for years for information on his family. I know his mother died when he was young so his father remarried and took his new wife and the other children to America in the second half of the 19th century. William, being 15 was old enough to join the Royal Navy as a boy sailor so he was left behind. he joined a training ship, HMS Conwy in 1855 and spent the next few years rising through the ranks. By 1861 he was sailing on the Victor Emmanuel, and thereafter he sailed the China seas on tea clippers as First Mate. He never saw any of his family again and I have searched for clues as to their home and their destination. Who would have thought that a trip to take photographs of daffodils in Gloucestershire would throw up a fresh lead for me to follow in the archives. It is just amazing and I am thrilled. Spring is in the air in the British Isles and that picture of daffodils brought to mind that lovely verse from an era gone by. Do you remember these lines penned by William Wordsworth in the 18th century? So, how would your day out have occurred to you, if you had had this verse in mind? I. Certainly did have that poem in mind. It is beautiful. Thank you for reading!